Our 2016 Calendars are here!! This time we wanted to try something a little different and the wonderfully talented and Doberman loving John Feller of JC Feller Photography offered up his services to help us create a one-of-a-kind rescue calendar. He enlisted the help of several stunning, Doberman-loving, professional models that donated their time and spent an entire day with us making this happen. 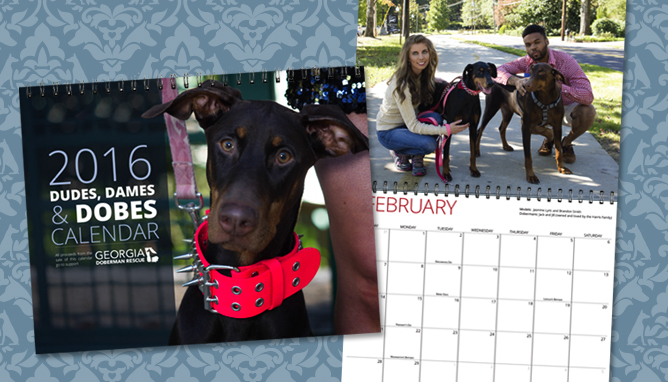 We were also able to bring out several of our adopted and fostered Dobermans to be featured in the calendar. ALL the models and John Feller donated their time to make this calendar possible, and for that GDR gives the most heartfelt thanks. 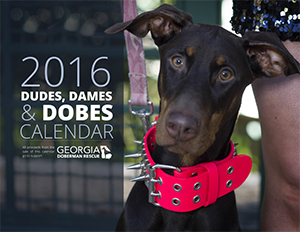 We are all very excited about this calendar and hope our supporters and Doberman lovers everywhere love it as much as we do! Calendars are printed on Premium 100# Gloss Book stock. Each month is printed in full color 8½” x 11″ format with metal spiral binding and a hole for wall hanging. What is your mailing zip code? Only your p.o. box and city and state are shown. But no zip. Would like to send a donation for Arielle. Thanks. What is your mailing zip code? Only your p.o. box and city and state are shown. Would like to send a donation for Arielle. Thanks. 2017 GDR calendars are here! Georgia Doberman Rescue is a non-profit organization that is completely volunteer run. If you would like to make a donation to our cause to help this breed, please click on the donate button below.